Two huts, open tops, fantastic views on a fine day typical Ruahine travel. 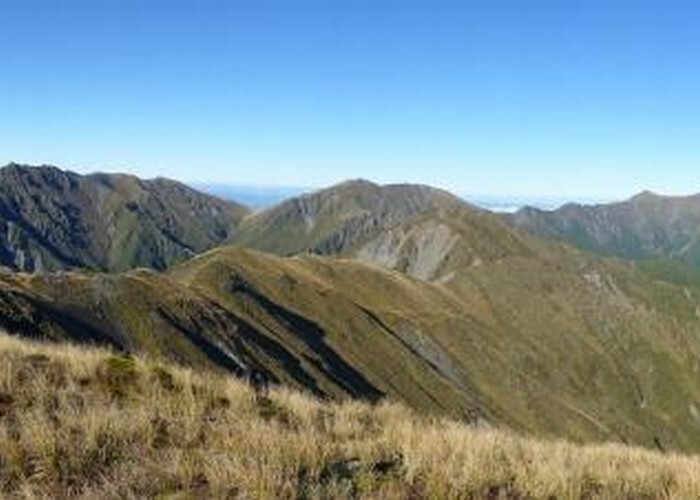 Ruahine Panorama • By Briar. Licence: C.
Carpark at the end of Mangakukeke to Purity hut 2.5 to 3hrs Follow the poled route over farm land with a 400 metre climb to the bush line (memo to self dont do this on a cloudless sunny day its hot). ---------- Purity hut to Wooden Peg 1.5 hours easy steady climb through the tops. Take time out here to walk over to Mangaweka 1/2 hour each way. A must if your a peak bagger ordinary if the clag has set in. On a good day the views are worth it. ----------- Descent from Wooden peg to Kelly knight hut 2.5 hours and most of it a steady descent on a well marked and cut track. ------------ Kelly knight Hut to Mangakukeke road carpark 2.5 to 3 hours last hour over prvate land get permission from the farm manager 06 382 5577 currently Colin Thompson. Added 14 November 2010 by bigpaulbigpaul. 2 revisions, most recently 21 November 2010 by bigpaulbigpaul. 177 views in the past year (15 per month).